Everybody knows how to thread a needle. Maybe. 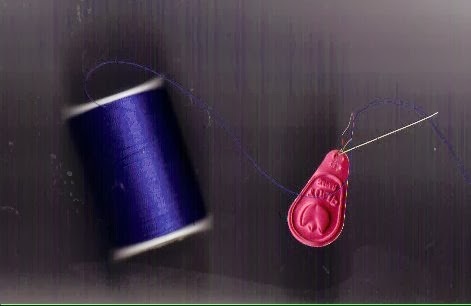 If your thread twists when you sew by hand or if you get knots in the thread when you pull it through the fabric, you may not know how. This may be one of those things you didn't know that you didn't know. I could sew before I could read or thread the needle, so "how to thread a needle" was never part of my sewing education. My Grandma threaded the needle, and I sewed scraps together to make a purse. It probably allowed coins to slip through the large stitches, but I made it myself and carried it around the house until I started sewing doll clothes by hand. Then, I was allowed to climb on the stool and quilt, but the quilting threads were already started. I never needed to know how to thread the needle. Years after I learned to sew, I often had thread that twisted with every stitch. Eventually, I figured out how to avoid twisted thread. If you have twisted thread when you sew, it's not the thread. It's the way you thread the needle. Thread has a directional twist that makes a difference when you thread the needle. 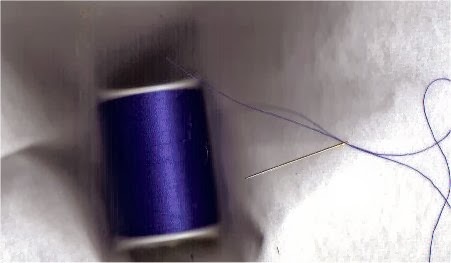 Here's the easy way to avoid twisting of the thread. Thread the hand sewing needle before you cut the thread off the spool. Set the spool on the table or your lap and push the thread through the eye of the needle. When you cut the thread off the spool, knot that end as soon as you make the cut. When you sew, you'll be pulling the thread through the fabric along the diagonal twist and not against it. This prevents the thread from twisting when you sew. You may have twisting with embroidery thread and perle cotton, particularly if you rewind the thread onto a cardboard flat or if you split the six-strand embroidery thread into two or three threads. It's the same principle -- thread the needle from the original open end of the thread and tie the knot at the end closest to the original wrap. If you rewind the thread onto a cardboard, you'll have the reverse. You'll need to tie a knot in the end, take the thread off, cut it, and thread from the end you just cut. This is confusing when you divide the six-strand embroidery thread into two or three strands. Keep track of the end that comes out of the original floss package first as that's the end that goes in the needle. If you mess up and the thread starts to tangle when you sew, you can start over and thread from the opposite end -- but you can learn to avoid the extra steps with a little care -- and knowledge. Improve your hand sewing skills with this easy technique. Make crafts faster and neater.